Gap made an apology for one of its shirts featuring a map of China that upset China’s internet users. 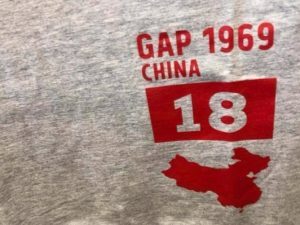 One user on Weibo posted photos of a Gap t-shirt saying it was in a Canada Gap store and that the map design did not include Taiwan or islands Beijing claims as its own in the South China Sea. The clothing brand, based in the U.S., is the most recent international business to be in trouble with the government of China over that country’s territorial issues. Beijing considers Taiwan, which is self-governed, an integral part of China and becomes highly upset when anything to the contrary is suggested. China claims sovereignty as well to a large area within the South China Sea that includes areas other countries claim as theirs such as the Philippines and Vietnam. Gap announced that it stopped offering the T-shirts in question for the Chinese market and had them destroyed. The company, through a prepared statement posted on Weibo, said that it respects the territorial integrity and sovereignty of China and learned that a T-shirt in its Gap brand sold in some markets overseas did not reflect a map of China that was correct in design. The statement continued by saying the company sincerely apologizes for the unintentional error and an internal inspection is being conduct because of the discovery. Gap did not say if the product would be pulled from other markets where it is being sold. Several other large Western brands apologized for errors related to territorial issues in China. In January, websites as well as apps for Marriott were blocked for more than week after the hospitality company listed Hong Kong, Macau, Taiwan and Tibet as individual countries in both emails as well as apps. An apology was issued by Marriott saying that it respected and supported the sovereignty as well as territorial integrity of China. Delta Air Lines based in the U.S. and Zara the European based clothing retailer were on the hot seat as well over issues of a similar nature on their e-commerce sites in China. Each of the companies has subsequently apologized. Beijing has pressured international businesses to make changes to their websites that are outside China, prompting a clash with the government of the U.S. The White House in early May called Chinese demands, that over 30 international airlines including a few in the U.S., remove from their websites any data that might suggest that Hong Kong, Macau and Taiwan were not part of China, as being Orwellian nonsense.